San Gimignano | Just Visit Siena ! If you have possibility to visit this small walled medieval hill town, don’t wonder too much! Just go! And it doesn’t matter if it’s sunny or rainy. This town has its unique beauty that it’s so good to discover. Weather is absolutely not important. I had strong rain . . . but I don’t regret even for a moment! Was happy to be there and took some pictures for you. But it doesn’t change a fact that will go there one more time on sunny day. At the beginning a bit of history . 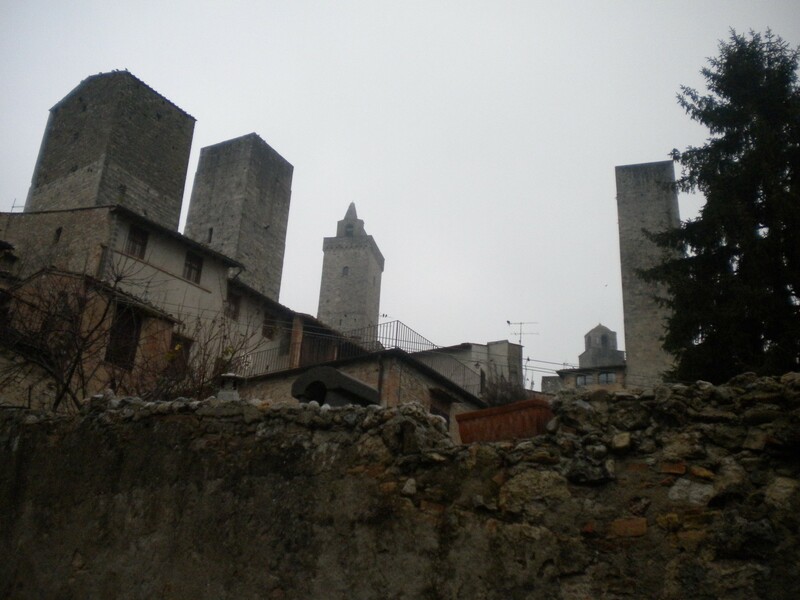 . . everything started in the 1st century, when two patrician brothers, Muzio and Silvio fled Rome and built two castles, Mucchio and Silvia (now San Gimignano). The name of Silvia was changed to San Gimignano. Then entered Bishop Geminianus with his intervention to spare the castle from destruction. As a result, a church was dedicated to the Saint and in the 6th and 7th centuries a walled village grew up around it. So like this in essence was formed this small and picturesque town. As you will learn San Gimignano is known as the Town of Fine Towers and it’s famous for its medieval architecture, unique in the preservation of about a dozen of its tower houses, which, with its hilltop setting and encircling walls form “an unforgettable skyline”. You can’t miss Piazza della Cisterna (that is the main square of the town), Piazza Duomo, and of course famous towers. Within the walls, you can find the buildings that are examples of both Romanesque and Gothic architecture. The Palazzo Comunale, the Collegiate Church and Church of Sant’ Agostino contain beautiful frescos. 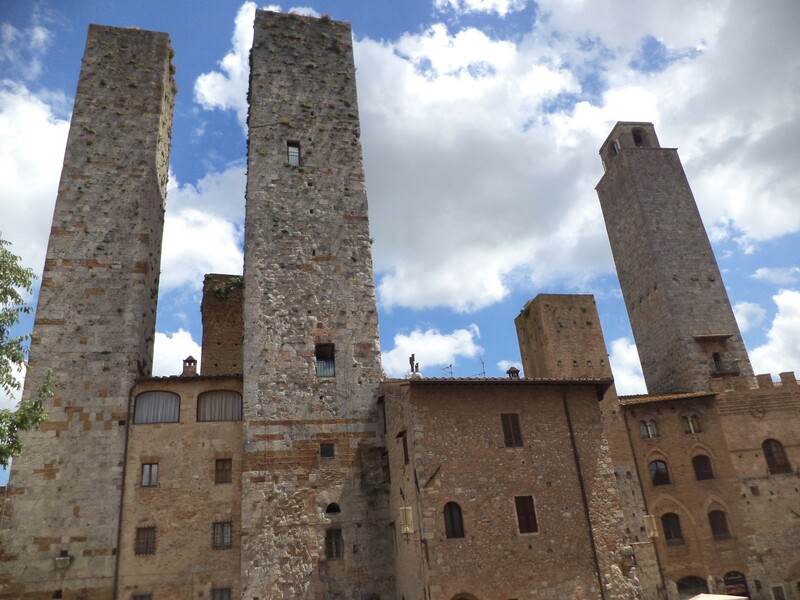 What is more the “Historic Centre of San Gimignano”, is a UNESCO World Heritage Site. The town also is known for the white wine, Vernaccia di San Gimignano. You can taste it and buy it there. Also if you are lover of small Tuscany shops with typical products as well as souvenirs for sure you will be not disappointed. At the end some practical information about how to get there. Everything you can find here http://www.sienamobilita.it/orari.html. Bus number 130 departs every 40 minutes. The travel time is about 70 minutes. And single ticket costs 6 EUR. So what are you waiting for?! 🙂 Don’t forget to add San Gimignano to your travel list. In spite of all I wish you a sunny day there. But as I mentioned even rain doesn’t have an impact. This you can see below.